So if you were working in Xero today, or have just logged in you may well be thinking: WTF? Why has it changed? I liked it the way it was! We also liked it, but Xero have been adding sooo many new features, that users were reporting that things were becoming hard to find. Xero’s answer was to listen, research and test, and do the right thing, which was an update. The best way to answer this is to click and play. Everything is still there but it’s all been tidied up. For instance, under the Business tab, you can now easily access sales, quotes, purchases and purchase orders, instead of having to dig into the sales module to find your quotes. This is mainly for features your bookeeper or accountant will be using. If you’re a more advanced user you can find things here like reports, and in the Advanced Accounting (at the bottom of the dropdown list) you’ll find things like Financial Settings and Tracking Categories. These still have their own tabs, so all is good. 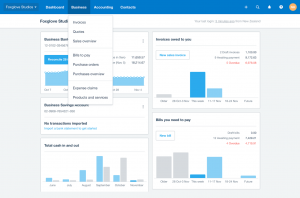 This is a quick look at Xero’s new navigation – if you’re stuck just holler!! If you’d like more in depth explanations, head over to Xero’s blog on the new navigation.